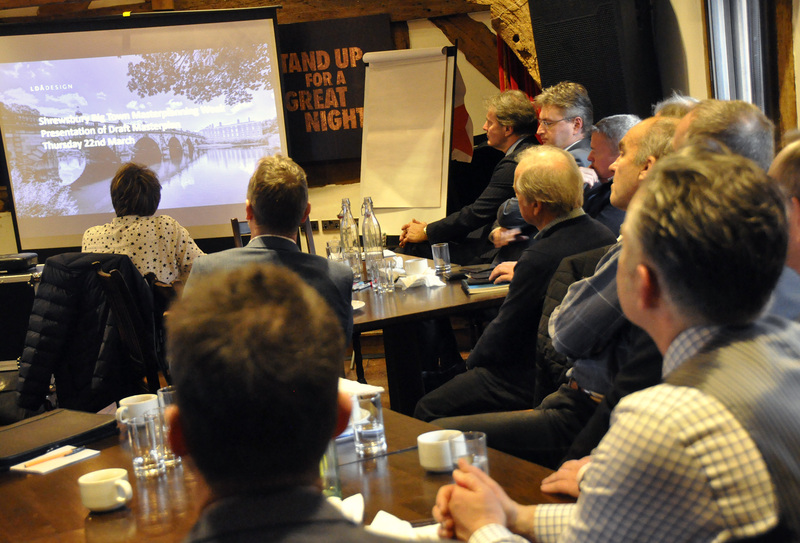 Last week over fifty organisations came together through a series of workshops to develop the Shrewsbury Big Town Plan. Project partners Shrewsbury BID, Shrewsbury Town Council and Shropshire Council are working with LDA Design to create a new Masterplan which aims to enhance the county town’s appeal as a place to visit, live, work and invest. Over the coming weeks illustrative maps, 3D models and artistic impressions will be worked up to form part of a comprehensive document showcasing the shared vision for Shrewsbury. The masterplan builds on the public consultation in September at which over 5,000 local residents and businesses took part. Alan Mosley, Leader of Shrewsbury Town Council added: “It has been a delight to work with the BID and representatives of Shropshire Council over the last six months in a partnership with the intention of drawing up a vision for Shrewsbury. The aim has been to collectively produce proposals which will stimulate and guide developments for the next 10-15 years. “The Masterplanning week which LDA managed was a revelation with over fifty participating stakeholders representing interests throughout Shrewsbury. LDA will now work with the Partners to produce a final set of recommendations. The work of the all involved so far means that these proposals will be fresh, vibrant, carefully researched, sustainable, optimistic but realistically grounded. There are challenges in some areas but all can be confident that the Vision will present Shrewsbury with an overarching strategy to make it an even better place to live, work, visit and do business. “The positive response to the approach and format of last week’s master planning of the town has been remarkable. Over 50 organisations and businesses engaged with us and that’s in addition to the 2,500 responses to the public consultation last September. What the businesses and the people of Shrewsbury need and want has most definitely been communicated to LDA Design, who did an amazing job over the week and I am sure will subsequent produce a great plan for the town that will take us forward. Shropshire Council is proud to have been involved in the work so far and is committed in bringing the Big Town Plan to fruition in the coming years.